According to the Chinese historian Sima Qian (145 - 90 BC) the first Chinese ruler was the legendary Yellow Emperor or Huang-di. He was one of the mythological Five Emperors who ruled during the period preceding the Xia Dynasty. Yellow Emperor and his successors Zhuanxu, Emperor Ku, Emperor Yao and Emperor Shuh are credited with the introduction of governmental institutions, coined money, writing, compass and many other important inventions. Xia Dynasty is the first Chinese dynasty mentioned in written sources although its actual existence is still a matter of debate. According to the legend Xia Dynasty was founded by Yu or Yu the Great in the 21st century BC. Yu the Great supposedly saved China by introducing the system of flood control and hereditary system of rule. The tradition names 16 rulers of the Xia Dynasty which ends with Jie. 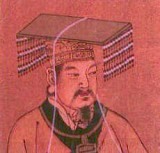 The rule of the Xia Dynasty ended with a rebellion led by Tang of Shang Dynasty who replaced the Xia Dynasty as Chinese ruling dynasty in the 16th century BC.